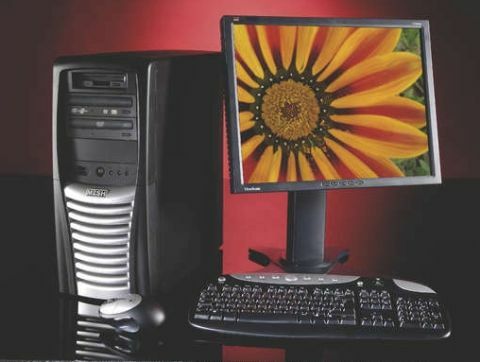 The average PC display comes with some nasty clip-on stand and offers minimal height or positional adjustments. So it's just as well that the Mesh Photo 5000 utilises ViewSonic's 20.1-inch VP2030B display, which is as far from 'average' as it's possible to get. The viewing angles are a wide 170 degrees, contrast is an impressive 1,000:1 and response time is a gamer-friendly 8ms. The 1,600 x 1,200 resolution is comfortable to use, and some intelligent tuning options help ensure that you achieve bright, colourful but also accurate images. It's fitted with a USB hub and it looks great, too: easily one of the best looking we've seen. The unusual extras continue with a 60GB external hard drive, which is handy for backups or taking videos or images to show someone else. This has a memory card reader, too, enabling easy import of photos direct from your digital camera's storage. All set for Media Center we were surprised to see that the Mesh Photo 5000 was a Windows XP Media Center Edition system. Granted, Media Center does have its own video and image management systems, but we're not convinced that they'd be the best choice for most people. You do get a TV tuner courtesy of the All-In-Wonder X1800XL graphics card, though, and it's easy to plug the system into your own TV.